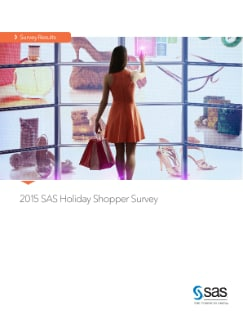 In October 2015, SAS conducted online survey research among 3,458 adult consumers to uncover their festive buying intentions. UK spending is set to increase, but retailers face headache of having to know who is shopping for what product at what price, via what channel and when, to be among 'the winners'. Price is the most important factor in gift-buying, with three in four Brits (75 per cent) ranking it as their most important consideration. Getting a bargain came in second (51 per cent), followed by having the item in stock (46 per cent). The research shows that the UK is set for a prosperous Christmas with eight out of 10 consumers planning to spend about the same or more on gifts compared to last year. A fifth of Brits say they have a higher budget this year to indulge family and friends. The most optimistic shoppers are the 18- to 29-old-age group, with 29 per cent planning to spend more. This again adds to the uncertainty for retailers, with buying behaviour for this age group being more difficult to forecast. Complete your details to download your copy of the survey findings.